New album released in Japan! 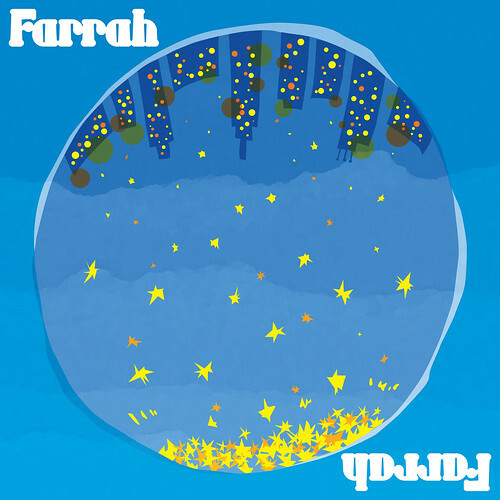 After nine months of constant recording in the band’s south London studio hideaway, where they were competing with flash floods, mice infestations and exploding amps, the band’s fourth album, creatively titled Farrah, is coming out in Japan this week on brand new label Fabtone! The Japan-only version of the album features 13 brand new tracks with a special Japan-only song, “Slow Down”. There’s also a guest key-tar solo by Ben Romans from The Click Five on the track “Heavy Metal” (currently on the Farrah MySpace player). Press and radio have already highly praised the album, with “Stereotypes” (one of the key tracks) creating waves on Japanese radio. The album is due to hit the rest of the world in autumn, 2009. 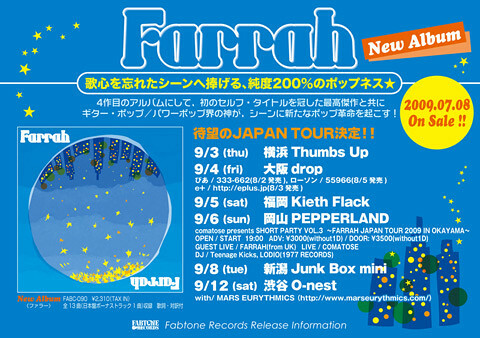 After a long sabbatical recording their fourth record, Farrah will be heading out to play dates in the UK, Spain and Japan over the next 6 months in support of the new album. Starting with the Otodama Sea Studio Festival on July 18th at Japan’s Zushi Beach, Michelle and Jez will be playing a special one-off acoustic set, followed by an appearance at the amazing indoor Nano-Mugen Festival at Yokohama Arena in Japan on July 20th with Manic Street Preachers, Ben Folds, Hard-Fi and Nada Surf. The band will then be heading to Spain for the awesome Vibrasions festival in Pontevedra on August 1st. Keep a look out for more shows in the UK in the autumn. As always, details will be posted on the site as gigs are confirmed.